Mark Zuckerberg just did a live video stream on Facebook (where else) from Berlin where he detailed plans to give 25 high-power GPU servers to European research labs in order to accelerate advances in intelligent computing. The Facebook AI Research (FAIR) Partnership Program starts with the donation of four servers to German computer science academic Klaus-Robert Müller for his research at the Technical University of Berlin. The team here is working on image analysis of breast cancer, as well as chemical modeling of molecules. He was joined on stage by Facebook’s director of Facebook AI Research Yann LeCun to talk about the company’s vision for the future of artificial intelligence. He also said he expects that the VR googles we’re now familiar with seeing today will – within the next decade – become just like the glasses we wear every day. 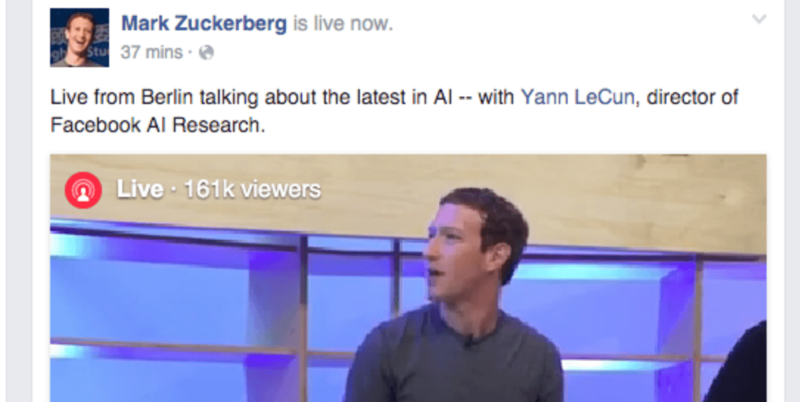 Of course, this wasn’t just about AI, it was also a chance to show off Facebook Live, where you’re able to stream video straight to your timeline or subscribe to a channel like Zuck’s so you get to know when his next video is going live. Facebook automatically creates a recording of the stream too, which is posted afterwards on your wall, although his hasn’t been pushed out yet. Interested public institutions can apply now to be part of the program but, like FAIR itself, participants must agree to open source their findings.